Five connected buildings constructed around 1900, formerly manufacturing, completely renovated from 1997 to 2003 for offices, showrooms, light manufacturing. Offices ranging from 1,300s.f. to 7,900 s.f. Some display production, and furniture manufacturing. Heavily trafficked road, limited street parking, ample parking on-site. 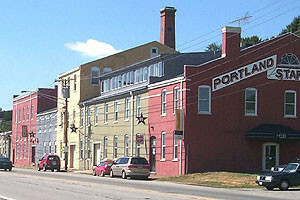 On Portland's primary waterfront access road, at the perimeter of downtown.